Fluids are cool and they are everywhere. Think of tears, honey, hot showers, waterfalls, mud, lava and so on and so on… and fire and air and rocks. What? The last three ones surely aren’t fluids you might think of. But they are fluids as well and that is the beauty of the study of fluids. A fluid is anything really that changes its shape over time in a seamless manner. Even cooler is that their slick meandering over time can be described using fancy mathematics. Beautiful looking clouds, which are also a fluid, can be described precisely with beautiful and elegant mathematics. This is where Art meets Science. Leonardo da Vinci, the great Renaissance man, embodies this spirit perfectly with his famous paintings and his legendary scientific notes. How cool would it be to recreate these beautiful looking fluids on a computer screen? Well I still think it is cool. Having interests in, and dabbled in, Art, Science, Mathematics and other fun stuff I decided to take a shot at this fluid animation business. I did this research early on in my teens using the airbrush and producing some paintings. Some of these paintings I even sold. Then I discovered computers and their ability to turn on colorful dots on a screen through programming. That motivated me to write code and also opened the door to the universe of Mathematics. Then I stumbled into this awesome field called Computer Graphics. After having completed degrees in computer science and mathematics at the University of Geneva located in postcard Switzerland I decided to study computer graphics at a top notch university outside of Europe. The University of Toronto in Canada accepted my submission and I did graduate work there. First a master’s degree and then a PhD. What is a PhD? It gives you an opportunity to do whatever you like for a couple of years and learn stuff. The pay is modest but in exchange you are granted total freedom. In funky Toronto I studied the motion, look and feel of fluids. I got some papers published as a byproduct. Most notably at our annual Mecca called SIGGRAPH. I pursued these studies in Paris and Helsinki as a postdoc. What’s up doc? A postdoc is just an excuse to prolong your PhD vacation for a couple of more years and prepare you for a job for life at a university as a professor. That is of course if you published enough cool stuff. Basically as a result you stay in school for life and hang out with young students and you have to teach sometimes and spend time in faculty meetings. And if you are lucky you get what is called tenure: a well-paid job for life with no strings attached. No really this is for real. I decided not to pursue that path. I was fortunate enough when I was in Toronto to hook up with a cool company called Alias at the time. They contacted me and I was working for them part time and putting some of my code into one of their products called Power Animator. All of the sudden my stuff was being used in Hollywood. After I enjoyed my postdoc vacation in Paris and Helsinki, Alias which became “Alias|wavefront” in the meantime offered me a job in rainy Seattle. Cool. Grunge rock, bookstores, good coffee, left coast radicals, an office full of math dudes and so on… All this stuff appealed to me. I was supposed to work on something called “subdivision surfaces.” Subdivision is basically a technique that turns polygonal representations of shapes into smooth mathematical surfaces by chopping off corners. In a couple of weeks I proved that you did not have to chop off corners at all. I took subdivision out of subdivision surfaces. Now they were just good old surfaces that folks were used to. At the same time in between surface meetings I wrote a stable fluid solver. Just like that. That was the seed for my book. But before the book I wrote a paper called “Stable Fluids” which barely got accepted at SIGGRAPH in 1999. During my presentation I received applause. No one had ever seen interactive fluid animations live before. Then I ported the fluid solver to small devices like the Pocket PC which I showed again at SIGGRAPH in 2001. That lead me to a very simple implementation that I presented at the annual gamer conference called GDC in San Jose in 2003. That is the simple solver you can find in the book. 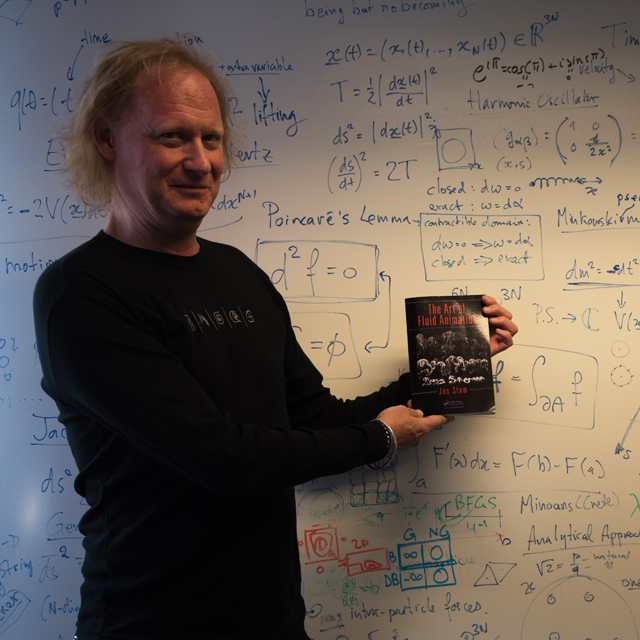 The book also talks about other exotica like bugs crawling on donuts using the almighty Fourier Transform and fluids crawling on iPhones and iPads and using an ad and a joint to control fluids. Many presentations followed of course in many continents except for Antarctica and Africa. Too bad: these two continents have a lot to offer in the way of fluids. I was also showered with prestigious awards: the SIGGRAPH technical achievement award in computer graphics and two technical Oscars. For years people had been asking me to write a book based on my presentations. I made fluid animation sound easy and accessible. It is so accessible that you can download my code and start creating your own fluid-like animations. 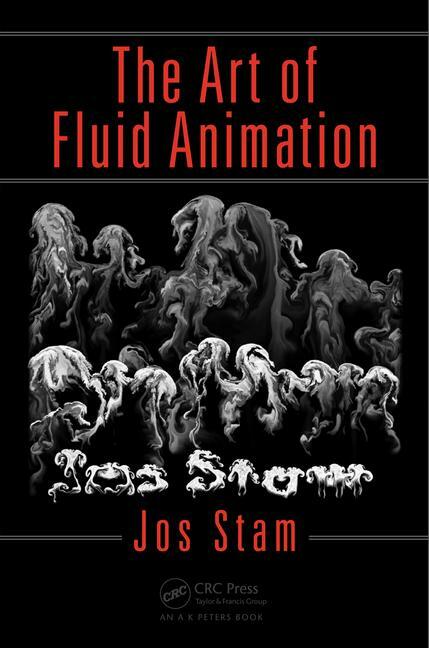 Finally in 2014 after I gave a keynote talk at a conference my publisher convinced me to write a book on fluid animation. I had nothing better to do at the time and Autodesk Okayed the project. I thought it would be easy: just write down what I usually say during a presentation. Well it turned out to be more work than I anticipated but it kept me busy. And I can call myself a writer now. The book is a very personal view of my understanding and my contributions to fluid animation. I tried to make this book engaging and fun to read. I tried to communicate my passion for Art, Mathematics and Computer Programming. I hope it will appeal to a wide audience. Enjoy.